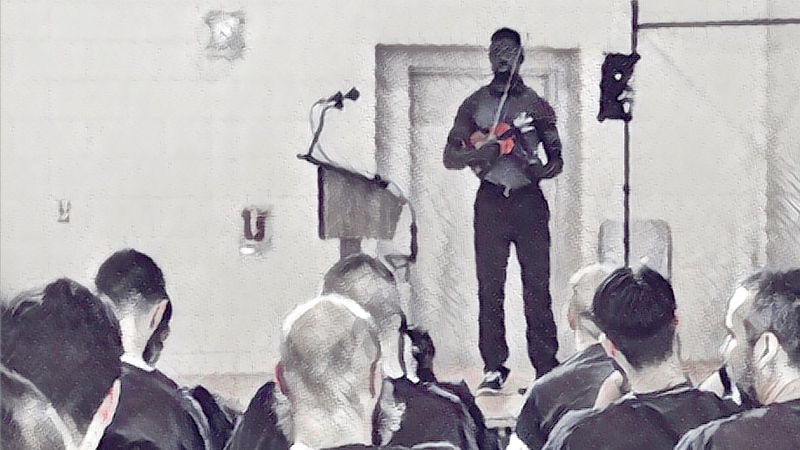 June 25, 2017, 5:49 PM · Over the weekend, I had the opportunity to give a violin concert at the Ordnance Correctional Facility for the inmates and staff. I couldn’t help but feel excited as security checked my equipment and allowed me to wheel my violin on a cart through the checkpoints. As the Lieutenant and Activity Coordinator escorted me, I continued to debate in my mind which piece to begin the concert. We entered the gymnasium and I only had a few minutes to tune and set up before the inmates entered the room. As I tuned my violin and saw people come in, I couldn’t help but smile because I’ve always wanted to play in a jail. I love bringing music to people. Especially in nursing homes, hospice, hospitals, and gyms because I feel as musicians we can make a positive impact through sharing our talents. The Activity Coordinator told me that male and female inmates are not often allowed in the same room, so it was a treat for everyone to be together. After everyone sat down, I introduced myself and said that I would play a variety of music, ranging from Disney’s "Frozen" to Queen’s "We Are the Champions." I began the concert with "Summertime" from Porgy and Bess and could feel the atmosphere in the room change, as it does in nursing homes and hospitals. Initially I felt anxious, yet in that moment I felt peace and warmth. As the concert continued, I could hear people singing as I played "Take Me Out to The Ballgame," and applause as I announced that I would play "Hey Jude" from the Beatles. I remember laughing at one point from the surprised looks I received after I said I would play "Free Bird." Yesterday was truly a joy and an experience I’ll never forget. I was only one person with an acoustic violin, yet the entire room sang and stomped their feet to the familiarity of songs from their past. Some of the inmates appreciated Disney’s "Frozen" because their family would watch the movie together, and they did not hesitate to belt out the lyrics and dance in their seats. I shared that my grandmother inspires me to continue playing music in the community and performing familiar songs. She struggles in her journey with Alzheimer’s and can no longer remember anything that happens short-term but can still recall all the words to her favorite hymns such as "How Great Thou Art" or music from her past. At the end of the concert, one of the inmates told me her mother had Alzheimer’s and believed music could help families reconnect. Another inmate said she was glad I played music from Charlie Brown and said she had a great time. One inmate shared that he loved "Free Bird" and that it was one of his favorite songs growing up. Maybe next time I can come back with a bigger band or actually play "The Devil Went Down to Georgia," but I learned how much of an impact I can make with my violin and a willing spirit. If you want to read more about my adventures with the violin you can follow me at healingstringsstudio.com. June 26, 2017 at 05:38 AM · Alexander you didnt mention what correction facility you played in. If you visit Los Angeles maybe you will play for the group where I live. Its called an assisted living facility.I am a violin teacher and have played in many orchestras in the Los Angeles area. I haven't been brave enough to play solo but have been in as many as five orchestras at one time juggling concert dates, sometimes giving two concerts on the same day. Most of these orchestras have been strickly classical, but now I am in the LA Lawyers Philharmonic and we have played Broadway numbers as well. Call me sometime Darren Briggs 818 621 4756. Solo violin is a heavy responsibility and especially to people who dont know classical music. June 26, 2017 at 04:18 PM · Alexander, you remain an inspiration! June 26, 2017 at 07:10 PM · Alexander this is fantastic, keep up the good spirit!